As a long, crazy, and hectic summer winds to a close, I’ve got a new mantra around our house: Keep It Simple! 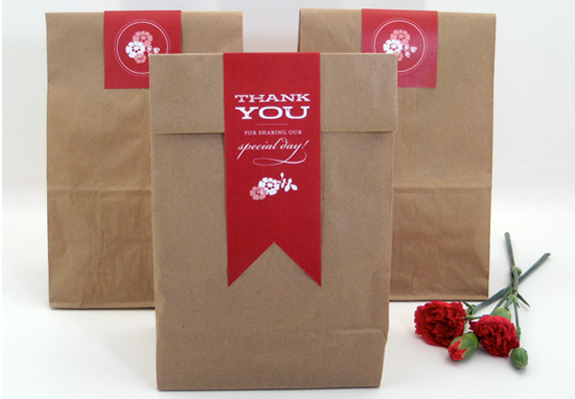 So, this week I’m inspired to share with you some simple, but adorable, DIY favor/gift bag ideas. I always love DIY wedding projects because they let you put your own creative stamp (no pun intended) on your special day. And with these DIY brown bag projects, you can keep the cost down as well. How will you fill your favor bags? Well, that’s up to you, but yummy homemade baked goods or other edible treats sound good to me! Don’t you just love the way the bright red paper labels “pop” against the brown background? This favor bag idea (courtesy of the wedding stationary experts at BetsyWhite.com) would fit in perfectly at a simple backyard bbq or beach wedding. Click here for easy instructions and template. 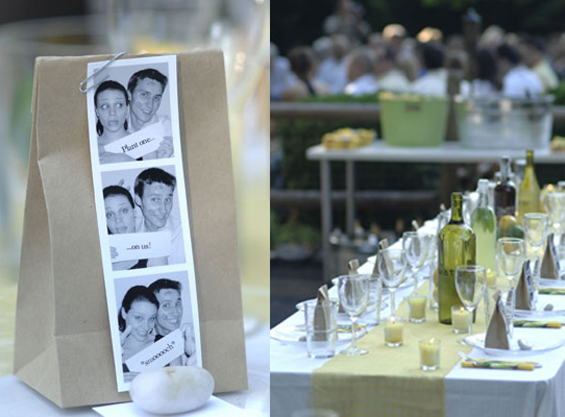 Here’s another fabulous idea from the creative minds of The Wedding Chicks. These sweet little DIY gift bags strike just the right note – proving that when it comes to weddings – you don’t have to pay a fortune to be stylish and chic. Simply download the template, print onto scalloped paper and attach to brown paper bags using a hole punch and pretty ribbon. Click here for complete instructions. I always save the best for last. And, although I love all today’s DIY tips, I think this one’s my favorite. It’s stylish, with a sense of humor. These mini brown bags are filled with single gladiolis bulbs. The front photostrip picture (of the bride and groom – he’s covered in lipstick kisses!) invites guests to “Plant One on Us!” Instructions for planting the bulb can be found on the back. You can find all the details for this project on Younghouselove. This awesome blog features one Richmond, Virginia, couple and their trials and tribulations as newlyweds and new homeowners. They planned an amazing DIY wedding in the backyard of their adorable new home, which is still the inspiration for their DIY blog. If your planning a backyard wedding and/or diving into some DIY projects at home, you’ve got to check them out – they’re so great. 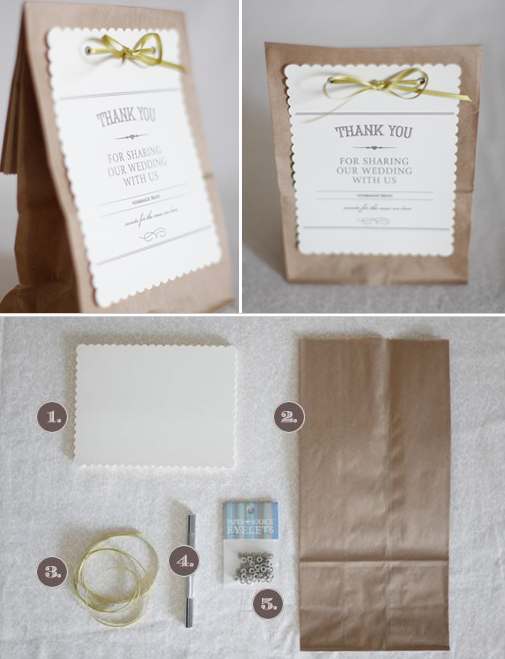 Hello, what a wonderful way to turn the humble brown bag into a fantastic addition for any wedding. We’ve got lots of brown bags at our tauranga wedding venue that we’ll be able to use. Hi there would you mind sharing which blog platform you’re using? I’m looking to start my own blog in the near future but I’m having a tough time selecting between BlogEngine/Wordpress/B2evolution and Drupal. The reason I ask is because your design and style seems different then most blogs and I’m looking for something unique. P.S Apologies for getting off-topic but I had to ask! Awesome issues here. I am very happy to look your article. Thank you so much and I am taking a look forward to touch you. Will you kindly drop me a mail?